Cherie began her career in transportation in 1967 in the household goods, moving and storage business with Allied Van Lines in Washington, D.C. and later National Van Lines in Virginia Beach, VA. For four years she worked with vans at Crescent Motor Lines in Spartanburg, SC. In 1978 she began working for automobile transporters as Office manager and Terminal Manager for Nu-Car Carriers in Norfolk, Baltimore and Pittsburgh and then Anchor Motor Freight in Lordstown, OH. In 1986 she started working with flatbeds at The Union Cartage Company of Youngstown, OH. From 1989 until 2002 Cherie was Terminal Manager of the Ohio terminal for Wm. Thomas Trucking of Albuquerque, NM. 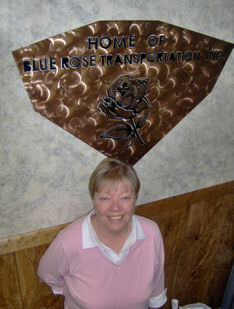 In November 2002 Cherie started Blue Rose Transportation, Inc. to fulfill a desire to own and manage her own company after 35 years experience in the industry. Roy began his career as a driver 40 years ago engaged in over-the-road long-haul flatbed operations. Roy and Cherie were married in 1999. Together with Cherie, Roy began Blue Rose Transportation, Inc. in November 2002 to fulfill his own dream of having his own company. Thanks to Roy's practical experience and Cherie's management knowledge, we are confident Blue Rose Transportation, Inc will continue to be successful for many years to come.